You will be advised at an appropriate moment in the application process about the type of visa required for your period of study in the UK and provided with information about the general requirements for applying for your visa. Through our close liaison with the UK institutions, we will ensure that you are provided with the documentation required for the smooth processing of your visa. We will recommend our appointed visa advisor who can assist you in making your visa application. All courses in the UK require a certain level of English and you will be advised by your LP counsellor about these requirements and offered advice on how best to obtain them. As most students will need to obtain a certain score in one of the recognised English exams such as IELTS , TOEFL or Pearson Academic, LP offer preparation classes with our appointed English language teachers. Classes can be arranged at our São Paulo office on Saturdays or at an alternative location during the week. Classes are also available via Skype with our qualified English teachers based in the UK. As all applications to UK college and university courses require at least a supporting statement written in English and in some cases further writing tasks, our teachers can assit you with the preparation of this material. We can offer you insurance cover specifically designed for the period that you will be studying in the UK. Cover is available through our Partner Endsleigh Insurance from as little as 7 GBP per week of study in the UK. For students wishng to spend time visiting other European countries, we can recommend alternative insurance cover to meet your needs. Most schools, colleges and universities that we represent will offer you the opportunity to stay in their student residences. We will advise you on the procedure for making an application to stay in this accommodation while also offering you alternative options through our experienced accommodation officer. Through our appointed translator, we offer a practical solution to the translation of your documentation which needs to be submitted in support of your application to UK universities. Contact your LP student counsellor to arrange a quotation for the documents you need translating. As part of our full range of services, we are able to arrange your flights, whenever possible for a student tariff. The next selection process will take place from 9th to 13th April 2019 in Sao Paulo and Rio. 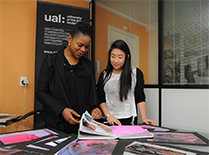 Your opportunity to discuss your objectives for studies and work in the creative industries with a visiting academic coordinator from UAL. As official representatives of UAL in Brazil, Language Partners can provide you with all the support you need to apply to the university. The best way to apply is by taking part in the selection processes for all the full time courses which takes place in Brazil three times a year, twice during the first semester and once in the second.